My muse, my inspiration, my touchstone for getting through life is — wait for it — Tinkerbell. She’s smart, she’s sassy, she’s fearless. She’s got the blonde-hair-green-eyes thing going on (me too). Wherever she goes, glittering pixie dust follows (seriously, how cool is that?). But mostly, I love Tink because she believes in believing. Millions of kids grew up watching some version of Peter Pan (I saw the TV special starring Mary Martin numerous times) and being implored to “clap if you believe in fairies” so that Tinkerbell might live. I nearly clapped my little hands off for Tink and guess what — she made it. Her tiny fairy light, which had almost stuttered out, began to grow, glimmer, and gleam. “Tink lives!” I thought. She made a believer out of me. Of course, I know that life isn’t so simple as to think that just believing will make something happen. But I also know that not believing will almost certainly not make it happen. What Tinkerbell inspires in me is the desire to put myself out there, to imagine without limits, and to believe in myself (even on those days when my light is less than brilliant). 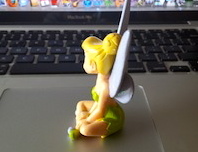 Shine on, Tink. Applause, applause. Tks, Tink. And thanks, Claudia. You’re welcome (from Tink and me! ).